If you're looking to give back to your community, stop by one of our events below and share the love. As a CDJR dealership in Ringgold, GA, we believe that it is imperative that we give back to the communities that support us. How else would we continue to provide you with top-notch vehicles from Chrysler and Dodge? If you're interested in participating in one of these events, please check out our information below and contact us with questions. We hope to see you at one or more of these events! May 3rd, 6pm - 8:30pm. 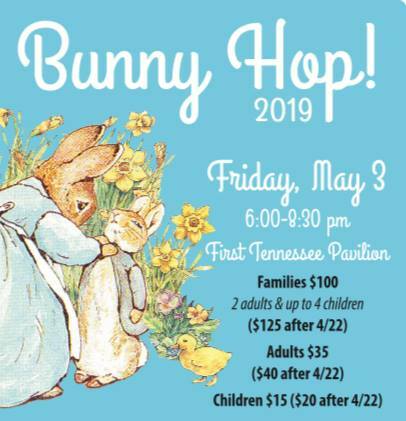 Chambliss Center for Children Bunny Hop! 2019. The Mtn View Auto Group is excited to be a part of the 19th annual Bunny Hop! on May 3rd. This event will benefit the Chambliss Center for Children. This family-friendly fundraiser will be held in the spacious, open-air First Tennessee Pavilion from 6:00 to 8:30 p.m. Enjoy the festivities with friends while your children take advantage of the numerous activities for kids. All ages are encouraged to attend, and, of course, grandparents and adults without children are also welcome. Admission is $35 for adults and $15 for children. Little ones under the age of 2 are free. A family package, which includes two adults and up to four children, is $100. Prices will increase after April 22nd. Reservations are requested ahead of time. To make a reservation, visit www.chamblisscenter.org. June 1st, 9am - 11PM. 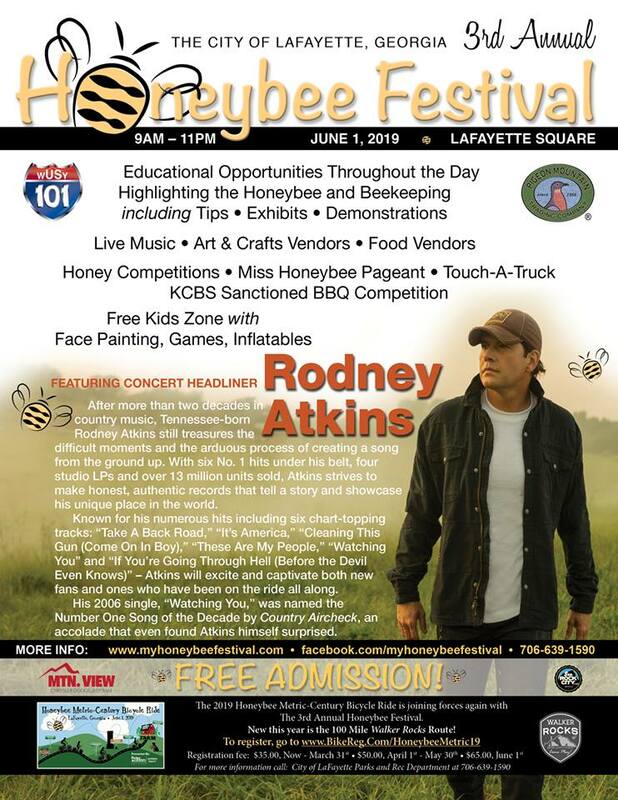 Honeybee Festival 2019. The Honeybee Festival is an annual festival whose theme is the honeybee, highlighting arts/crafts vendors as well as food and entertainment. Free Musical Entertainment will be a big part of the day long event, with many top local groups performing. Other activities will be a Kids Zone, a BBQ Competition, a Baking Contest, a Pageant, and a Cruise In including antique tractors, along with other activities. An education area will be filled with lots of learning opportunities. This is a FREE Event to attend and enjoy for the entire family! Learn more at www.myhoneybeefestival.com. April 13th, 9 am - 2 pm. 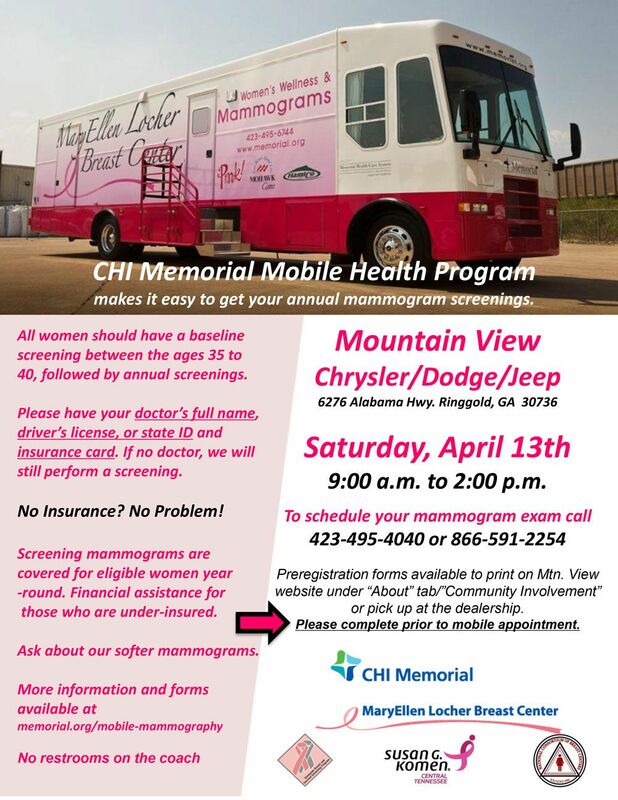 From the MaryEllen Locher Breast Center, the CHI Memorial Hospital's Mobile Health Coach will be at Mtn View Chrysler! Everyone who registers and participates will receive a coupon for a free oil change and multi-point inspection. Learn more on Memorial's website or call 423-495-4040. Please call and schedule an appointment at the number below. Then, print and complete preregistration forms and bring them with you to mammogram appointment. Please bring your driver’s license and if insured, your insurance card.” And remember, “No Insurance, No Problem.” Minimum age for screening is 35 years of age. No one under this age can be screened. To schedule an appointment for a mammogram call 423-495-4040. July 27th, Annual Jeep Jam.